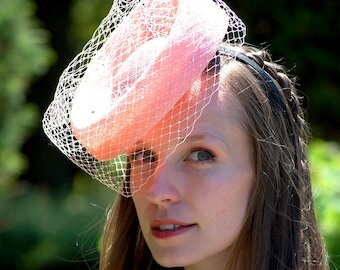 Announcement Aka Tombo Millinery - a modern twist on vintage chic specialising in kimono silk and Harris tweed cocktail hats for everyday fashion and special events. 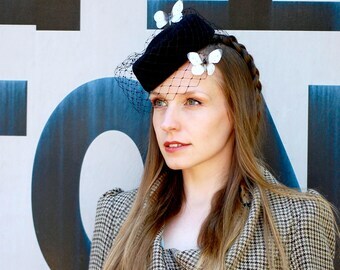 Aka Tombo Millinery - a modern twist on vintage chic specialising in kimono silk and Harris tweed cocktail hats for everyday fashion and special events. Arrived very quickly and a fun, cute little piece. Thanks! Absolutely beautiful! And such a lovely seller too. The hat is beautiful and the packaging was lovely. Thank you! 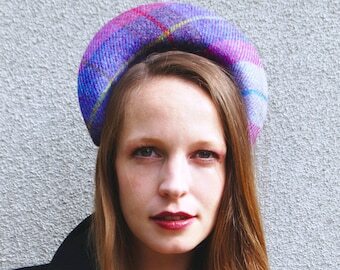 Pheigi Sugahara Macdonald is a Scottish born milliner currently living in the craziness of downtown Tokyo. 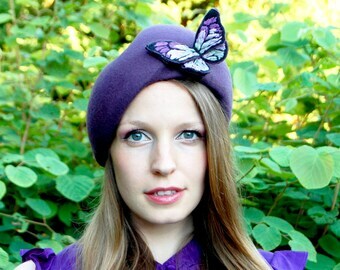 Drawing on both her Highland roots and her adopted home of Japan for inspiration she specialises in using Harris Tweed and kimono silk to create stunning, one off hats for special occasions and everyday wear. Throw in some vintage glamour, a magpie's love for shiny objects, a taste for RocknRoll and punk and a quirky sense of style and you get a small glimpse into the creative mind behind Aka Tombo Millinery. In 2008 I decided to travel around Asia visiting China, Nepal, India, Sri Lanka and Indonesia before returning to Japan where I now live. The experience was everything the travel books say and allot they don't. While every book showed pictures of colourful Sari, beautiful mountains and perfect white beaches they didn’t show the everyday sights of traveling and although I returned with the photo album everyone expects my strongest memory is one of dirt. For every beach I sunbathed on, I walked 10 streets coved in plastic wrappers, for every breath of fresh air I took in the Himalayas I took twenty smoke filled in Delhi, for every mountain I looked at, 30 buildings I should have seen were obscured by smog. While people blame this on poverty, politics and history all I could see was manmade dirt from manmade problems. On my return to Japan it became clear that these problems were not just evident in poor countries. Japan is a country of middle to upper-class people, governed by a democratically elected government and covered in concrete, filled with toxins and buried under the waste of its ever growing consumer culture. It was at this point I realised that we are all responsible for the state of the world we live in. The chopsticks I use in the sushi restaurant in Japan are made from wood taken from the forests of china leading to the extinction of the giant panda, the desertification of what used to be lush forests and the yellow sand that covers my windows every morning having blown across the inland sea. The bags I carry my shopping home in are filling landfills for thousands of years as well as clogging the world’s oceans, killing wildlife and destroying the beauty of the countryside (or in Japan where they are burned for fuel, releasing dioxins in to the air which end up in the soil and water before back on my plate). I realised that a vast change in the way we make, buy and discard everything in our lives was needed. Governments can set targets and NGO's can preach in every town center but nothing will change without consumer backing. Consumers are the ones who put money in the pockets of big companies. Consumers are the ones who make or break a product. Consumers are the ones with the responsibility. And so I threaded my needle and started to make it a little easier for consumers to buy planet-friendly. While researching other products available I realised that most eco-friendly products are bland and beige, the two words I hate most in the English language, so my aim is to be eco friendly AND funky. My designs are based on nature or a mix of Celtic designs from my homeland of Scotland, Japanese art (especially that of the indigenous Ainu people of Northern Japan) and art nouveau. In 2010 I got married and while trying to arrange a slighly off beat nature themed wedding I hit a wall of sequins and ivory lace. This has led me to expand Aka Tombo to include wedding veils and fascinators for those who are more colour orientated like myself. 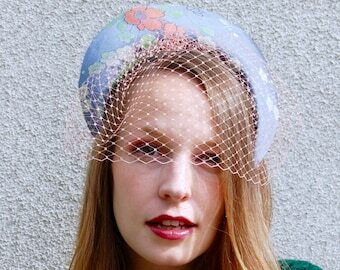 While I still try to be as earth friendly as possible there is no such thing as organic veiling and so I am forced to use synthetic fibers. The veil decorations however continue to be made use natural fabrics, recycled kimono, vintage or recycled buttons and pendants and whatever other pretty things I find lurking in my local antique shops. I hope you find what you are looking for on the site be it a gift for someone or a little something for yourself. If you are looking for something specific custom orders are always welcome. Buy Eco, change your light bulbs, grow your own veggies and don't spray bug killer on bees. Please let me know immediately if you are unhappy with your items. I want you to be happy and 100% satisfied with your purchase! If the hat arrives damaged or is not of the quality you expected please inform me by email as soon as the parcel is received and return arrangements will be made as well as a refund. A refund will only be given if the hat arrives in a damaged condition and I must be informed within 3 days of receipt. :: I only accept PayPal at this time. :: Payment is required within 2 days of transaction. I will cancel a sale if there is no communication within that timeframe and will relist the item. If you are unable to make payment within that timeframe, please send a convo immediately following the Etsy check out and arrangements will be made accordingly. All items are shipped using the Japanese Postal service as this is by far the cheapest method. Parcels can take between 5 days and two weeks to arrive. Unfortunately Japan post do not offer insurance or a tracking service. If you would like your item to arrive quicker or have insurance and tracking abilities it can be shipped using EMS. This however is more expensive. Please email me IN ADVANCE OF PURCHASE for EMS charges. I do not make any profit from shipping and will charge the exact amount the post office charges me. Postal charges from Japan to the US, UK, Europe, Australia and NZ are the same thus only one shipping charge is listed with each item however as I pay the postal service in Japanese Yen my shipping charges may change due to fluctuations in exchange rates. The price listed with each item at the time of purchase is the price you will pay for shipping. Aka Tombo Millinery is not responsible for any lost parcels unless posted EMS and no replacement or refund will be given if the hat is lost by the postal service. Your country of residence may add import charges and VAT on an item. 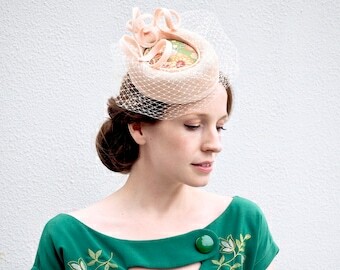 These charges are solely the responsibility of the buyer and Aka Tombo Millinery is not liable for any extra charges. Orders that are shipped to countries outside Japan may be subject to import taxes, customs duties and fees levied by the destination country. The recipient of an international shipment may be subject to such import taxes, customs duties and fees, which are levied once a shipment reaches your country. Additional charges for customs clearance must be borne by the recipient; Aka Tombo has no control over these charges and cannot predict what they may be. Customs policies vary widely from country to country; you should contact your local customs office for further information. When customs clearance procedures are required, it can cause delays beyond my original delivery estimates. It is an offence to falsify customs documents therefore when posting hats I cannot mark them as "gift" or falsify the value of the hat. Custom orders are always welcome please convo me for information. I can make something similar to what is in my shop but in different colours etc. 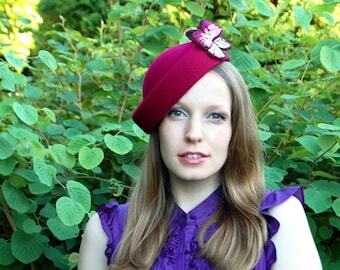 or make a completely one off piece to match an outfit or just an idea in your head.